My most distinctive Hellebore. It has more flowers than last year. Have never seen any that dark .......amazing. I have wanted some that dark but haven't been able to find them. Really beautiful. Blimey that IS beautiful ! Ooh, those are wonderful Barbara, you could picture those in a Victorian garden. Thank you all for your lovely comments - I like it too - but it might not be to everyone's taste. Very black indeed! Lovely. I keep seeing so many Hellebores in the GC's all so pretty, can't make up my mind!! Still have an area to degrass before I make any choices. It's very, very black! lol. This is so different, I think it's very very pretty. They've all left me with nothing to say. Which is perfect cos Im speechless!!! What a wonderful plant. And a picture to do it justice. You - speechless, Tetra? Never. LOL. Now how did I know you were going to say that lol!!! Well - yes, but I do like to keep my hellebores in a bed on their own. Don't know why, really, just so I can see them all and check on them, I suppose. Really unusual...haven't seen anything like that before! Thanks - yes, I agree, I haven't come across any others. really striking flowers. 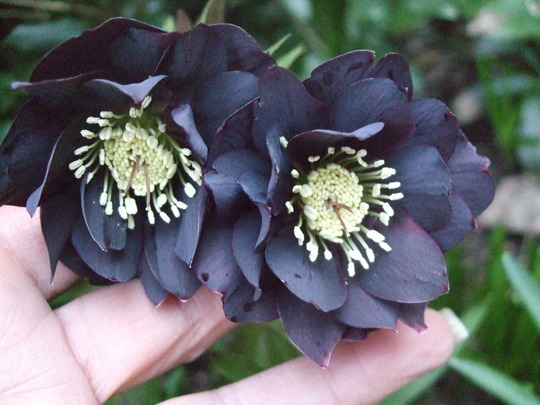 I have never seen black hellebores before and doubles too. No - it was a first for me, too. They are stunning! The colour reminds me of Cerinthe bracts if a bit darker. See who else is growing Helleborus x hybridus. See who else has plants in genus Helleborus.